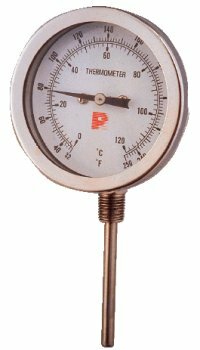 BI-Metal Thermometers Straight Form 90 Right/Left Angles Form - - - 3"~5"
All welded Sus304 stainless steel construction of this instrument can be resistant most of the corrosive working environment and bring the thermometer long service life. T he instrument has been designed to measure accurate temperature for industrial and laboratory applications. A hex nut located at the rear of the case is used for recalibrating.